As a premiere Eugene kid’s dentist, Dr. Kirchmeier believes that children need to receive dental care from a young age to ensure a lifetime of quality oral health. While it’s easy to think of a child’s baby teeth as only temporary, and therefore less important, they actually play an important role in determining a child’s long-term oral health. To ensure your child enjoys a great-looking smile for a lifetime, it’s important that your child start receiving dental care from a young age. To help parents better understand what dental care for their young kids means, here are the answers to a few commonly asked questions we receive about a child’s first visit to our Eugene kids’ dentist. The American Academy of Pediatric Dentists recommends a child should first see a dentist shortly after his or her first tooth eruption or by the age of 1. Not only will this early visit provide Dr. Kirchmeier the opportunity to get an early assessment of your child’s oral health, it will also give a child the chance to become comfortable with visiting our office. Our staff wants to make your child as comfortable as possible so the first appointment can go smoothly and be stress-free. Your child’s first dental appointment will consist of a relaxed and comfortably paced review of your child’s current oral health. Dr. Kirchmeier will collect any relevant information about your child’s medical and oral health, while also allowing your child to look around the office, meet our staff, sit in the dentist’s chair, and have a lot of fun. If your child appears comfortable with what’s going on, Dr. Kirchmeier will conduct a comprehensive dental exam. If you have any questions regarding the best oral hygiene habits or diet to help protect your child’s oral health, please feel free to ask during or after the exam. Dr. Kirchmeier will also usually perform a professional cleaning, fluoride therapy, and take any necessary x-rays during the visit. However, if your child becomes uncomfortable or fussy, any and all of these procedures can be postponed until another appointment. 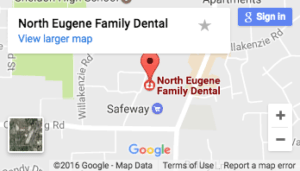 At North Eugene Family Dental, Dr. Kirchmeier and our staff will strive to make your child’s first visit to the dentist a positive and exciting adventure, using words that are pleasant and non-frightening to your child while offering explanations in “kid-friendly” terms. The relaxed atmosphere and friendly staff will help you and your child feel right at home. Arrive a few minutes before your scheduled appointment to give your child time to feel comfortable at our office. Get your child prepared to meet new people in a new place. Share fun and exciting stories about visiting the dentist from your own childhood. Send a family member or friend in your place. Not only would we love to meet you, but your child will have a much better experience if accompanied by mommy or daddy. Share negative stories about visiting the dentist. This only helps to reinforce to kids that visiting the dentist is something they should be afraid of.